Many CPAP users are interested in using pulse oximeters as part of their ongoing CPAP therapy. Data from a pulse oximeter can be used to check two important pieces of information - heart rate, and blood oxygen saturation percentage. In sleep apnea patients, the heart rate generally increases and the blood oxygen saturation level generally decereases during apnea events. A pulse oximeter with recording capability worn during sleep can help a CPAP user know if their CPAP therapy is effective. Unfortunately, even the most advanced CPAP machines do not record this type of information. A standard inexpensive pulse oximeter can allow a person to check their heart rate and blood oxygen saturation level right on the spot. This is useful during strenuous activity like exercising or hiking, and it's also useful in scenarios in which changing air pressure can be a factor in inhibiting normal brain function - notably, in aviation and mountain climbing. A recording pulse oximeter can allow a person to see these same two pieces of information over longer periods of time. This might be useful during exercise and other activities, and it might also be useful during sleep. Previously I wrote an article about pulse oximeters highlighting some features and the software that's included with some devices capable of recording data. In that article I focused on the CMS50E. Here I'm going to summarize the features you should look for in a pulse oximeter, so you can make an even more informed purchasing decision. This is the biggest difference you'll find in pulse oximeters. A recording pulse oximeter allows the user to wear the device for hours at a time, and then to look at the recorded data later. If you have sleep apnea and if you want to see what's going on at night when you sleep, then you'll need to select a model that has recording capability. If, on the other hand, you're looking for a device for periodic spot checking only, then either type of oximeter would be suitable. The CMS50D Plus, CMS50E, CMS50EW, CMS50F and CMS50H are all units which have recording capability and which include software for data analysis and report generation. The most basic pulse oximeter shows two numbers on a standard LED display - blood oxygen saturation level (SPO2) and heart rate (pulse). More advanced oximeters will show additional information, and will feature a nicer-looking OLED (organic LED) display. These displays generally show information like pulse waveform, pulse meter, perfusion index value, battery level indicator, and menus for various functions, depending on the particular model. 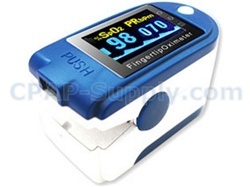 The CMS50DL is our most basic pulse oximeter with a simple LED display. This oximeter device uses the same technology as our more sophisticated models, so it's an extremely accurate and reliable choice for spot checking. All the other pulse oximeter devices we sell have OLED displays with varying levels of functionality. The pulse oximeters with recording capability have built-in alarms that allow the user to set thresholds at which the alarms will sound. In addition these devices also have a low battery alarm. Alarms can be useful in many activities to let you know that you've exceeded your desired heart rate, or that your blood oxygen level has fallen below a pre-determined level. The CMS50DL and CMS50D models DO NOT have alarms. The CMS50D Plus, CMS50E, CMS50EW, CMS50F, and CMS50H all have alarm functionality. There are two battery types from which to choose - rechargeable lithium-ion and standard alkaline. Some users like the convenience and potential cost-savings of the lithium-ion battery. Some users prefer not having to rely on a rechargeable battery which will eventually wear out (after several years). The CMS50DL, CMS50D, and CMS50D Plus all use standard AAA alkaline batteries. If you have rechargeable AAA Ni-MH batteries, they'll likely work in these units. There's no harm in trying. The biggest problem you might run into here is fit. Some rechargeable Ni-MH batteries are slightly larger than standard alkaline batteries. If your rechargeables work then you'll save money over time, and you won't have to worry about the lifespan of a permanent battery. The CMS50E, CMS50EW, CMS50F, and CMS50H all have built-in, permanent, non-serviceable lithium-ion batteries. These batteries will last several years, but eventually the performance of these batteries will degrade. The CMS50QB (for pediatric applications) has a removable, rechargeable lithium-ion battery. It's the only model we sell with this type of battery. Almost all fingertip oximeters will feel pretty much the same when applied to a finger. The clamp-like alligator clip design is ubiquitous. Many users can wear this type of device for hours without feeling any discomfort. Some people need to switch fingers after a couple of hours. It's best to listen to your body when wearing a pulse oximeter for extended periods of time. If it hurts, take it off. The CMS50F is an example of a pulse oximeter device with a wrist display and a separate fingertip sensor attached by a cord. The sensor for the 50F is not a clip, so it doesn't put a lot of pressure on the fingertip. This type of sensor is ideal for sleeping. All the other devices we sell are the typical alligator clip sensors, with all functionality built right into the device that fits on the finger. Perfusion index is a relative value that indicates the strength of the pulse at the sensor site. The perfusion index is commonly used to help identify appropriate sensor application sites. This means that you can use the perfusion index to determine where you're getting a good reading. You can move the oximeter from one finger to another to see if there is a difference in perfusion index. It's a good idea to place the oximeter where the perfusion index is highest. The perfusion index can also help to identify any anomalous readings during recording. If you see data that looks inaccurate it could be due to temporary incorrect positioning of the sensor on the finger. A low perfusion index value corresponding to the "bad" or "artifact" data can help you determine the true nature of the data. Some oximeters like the CMS50EW allow for wireless transmission of real-time data to a computer running the software included with the oximeter. In our eperience the practical application of this for most users is rather limited. Obvioulsy, if a caregiver wants to monitor patient data from across the room, wireless is a key feature. In our experience, the CMS50EW can transmit reliably from within about 15 feet. The computer running the software must be Bluetooth-capable. If the computer doesn't have Bluetooth built-in, a Bluetooth dongle can be used. For the average user who will not be using an oximeter as a caregiver, there is no useful application of the wireless feature. Unfortunately, none of the pulse oximeters we sell are compatible with CPAP machines. Many CPAP machines can record different types of data - like compliance data, and flow limitation data - but most CPAP machines cannot be connected to an external pulse oximeter to simultaneously record heart rate and SPO2. There's one exception to this general rule. When connected to a special Nonin pulse oximeter, the DeVilbiss IntelliPAP CPAP machines can record the data from the pulse oximeter device. If an IntelliPAP user also has the IntelliPAP SmartLink software, then the data reports that are generated from that software will include the data recorded from the pulse oximeter. This is the most ideal way to see correlations between recorded apnea events and heart rate and oxygen level events. All the oximeters we sell have 2-year warranties. We see other companies selling the exact same oximeters advertising only a 1-year warranty. They're probably doing this for a couple of reasons: 1) they don't want to hear about your problems after the sale, and 2) they probably have inventory that sits on their shelves for a year (since the manufacturer warranty begins when the dealer receives the equipment from the manufacturer). That second issue could be problematic if you're buying a pulse oximeter with a rechargeable lithium-ion battery, since lithium-ion batteries shouldn't be left to discharge for long periods of time with no maintenance. A neglected battery and a short warranty are two things you don't want to have to deal with. Caveat emptor. We're oximeter experts and we know we can help you choose the right pulse oximeter for your specific application. If you have any questions, feel free to contact us any time. We look forward to hearing from you!